Top row: Shah Wali Karzai; Ahmed Wali Karzai; Hamid Karzai, now president; and Abdul Wali Karzai. Bottom row: Abdul Ahmad Karzai; Qayum Karzai; Abdul Ahad Karzai, the patriarch; and Mahmoud Karzai. There are two schools of thought about Hamid Karzai. The first is that he's a vain, incompetent, monumentally corrupt leader with serious mood-disorder problems that require medication. The second is that the President of Afghanistan is a deceptively clever politician who has built a serviceable coalition among Afghanistan's riot of tribes and factions — which requires a certain amount of skill and, shall we say, lubrication — and a deft public figure who knows how to balance his dependence on the U.S. military against his public increasing frustration with an endless war. But in 2010, the notion of Hamid Karzai as a solid, legitimate Afghan leader died a slow, wasting death. Karzai's character was well described by US Ambassador Karl Eikenberry in a leaked cable in which he wrote of "a paranoid and weak individual unfamiliar with the basics of nation-building". Hamid Karzai, Afghanistan's first elected president, since 2004. Hamed Karzai was born on December 24, 1957 in the village of Karz, Kandahar he was the fourth of seven children. 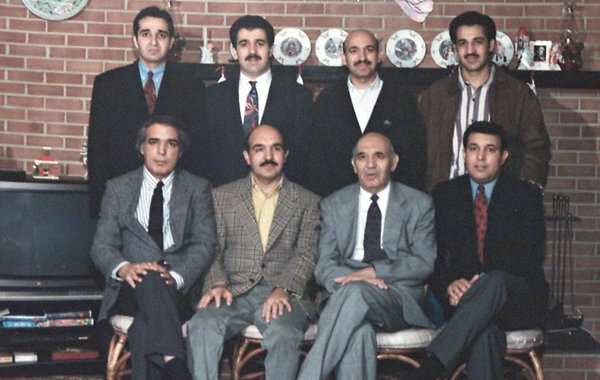 Karzai has six brothers, including Mahmoud Karzai, Qayum Karzai, Ahmed Wali Karzai, and one sister Fauzia Karzai. Karzai is an ethnic Pashtun from a subtribe of the tribe of the Afghan royal family. His father, the late Abdul Ahad Karzai (1922 - 19990714), was a prominent Popolzai tribal leader and Deputy Speaker of the Afghan Parliament. When his late father was elected to the Afghan Parliament, along with his family Hamid Karzai moved to Kabul and attended Habibia High School. His father, Abdul Ahad Karzai, was gunned down by two Taliban men on a motorcycle outside a mosque in Quetta, Pakistan. He was 77 years old when he died. Hamid Karzai subsequently travelled to India and obtained his B.A. and M.A. in the field of political science and international relations from Shimla University. In 1985 the studious Karzai traveled to Paris, France, to study journalism at the Ecole Superieure. He joined the Afghan National Liberation Front a small monarchist faction of the anti-Soviet mujaheddin in Pakistan. He served as deputy foreign minister after the fall of the Soviet-backed government in 1992. During fighting in 1994, Karzai, then deputy foreign minister, was arrested by Afghan intelligence, by some accounts because he was in contact with Hekmatyar and other militia leaders to end the conflict. Karzai himself has said little about his confinement except that he escaped when rockets struck the building where he was held and that he made his way to Pakistan. At first supporting the Taliban, Karzai later unsuccessfully worked from Pakistan to overthrow the austere Islamists, returning to Afghanistan in late 2001 where he was appointed president of the country's interim government. Karzai became the first democratically elected leader of Afghanistan in 2004. Endemic government corruption, slow development and civilian casualties caused by foreign forces, have eroded his public support. Karzai has hinted at running in the election, saying he has "a job to complete". Karzai after the 2014 election wants to live on or close to ARG palace. According to Afghan officials, Karzai’s new home will be an old, European-style mansion that, once renovations are done, will be roughly 13,000 square feet. The spot selected sits just beyond the grounds of the Arg, a former royal palace that spreads across 83 acres in the center of Kabul and now serves as the presidential seat. The property is hidden behind high walls and security barricades. Afghan officials familiar with the plans say it includes buildings previously used by the National Security Council or perhaps by National Directorate of Security, the Afghan intelligence service. The renovation of old buildings and the construction of new ones, including a reception hall, began in July 2013, said Aimal Faizi, a spokesman for the president. And the scale would befit the new role he is said to desire: guiding whoever fills his old job, as a presidential adviser for life. 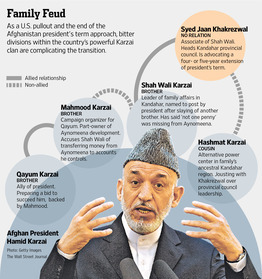 (20140224) The cynical view of Mr. Karzai’s postelection plans is that his main goal is to protect his family and others close to him, many of whom have amassed fortunes in the past 11 years. In 1999, Hamid Karzai married Dr. Zeenat Quraishi, an obstetrician by profession who was working as a doctor with Afghan refugees living in Pakistan. They have three children. A son was born in 2007 named Mirwais and later they had the first baby daughter Malalai. Karzai’s second daughter was born around 9:30 a.m. Tuesday 20140304 at the Fortis Memorial Research Institute in the New Delhi suburb of Gurgaon. Hamid Karzai was blessed with a baby girl, his fourth child was born on Tuesday morning (20160905) in private Gurgaon hospital in India. Karzai is well versed in several languages, including his mother-tongue Pushtu, as well as Persian (Dari), Urdu, Hindi, English and French. He is often seen wearing a Karakul hat, something that has been worn by many Afghan kings in the past. Karzais has close ties to CIA and UNOCAL: BBC Monitoring Service reported from the Saudi newspaper Al Watan on 11.12.2001, Karzai had close ties to CIA since the 80th and had worked for the American oil company Unocal. Karzai worked as a consultant for the huge US oil group Unocal, which had supported the Taleban movement and sought to construct a pipeline to transport oil and gas from the Islamic republics of Central Asia to Pakistan via Afghanistan. 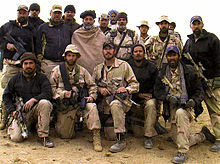 Hamed Karzai and a group of his men left secretly for southern Afghanistan on 8 October 2001, 24 hours after the US war started. Karzai did this in coordination with US officials, with the knowledge and approval of US Defence Secretary Donald Rumsfeld and CIA Director George Tenet. Since his entry into Afghanistan, Karzai has been in daily contact with CIA officials stationed in Pakistan or in northern Afghanistan. Through a private telephone line, Karzai briefed these officials on the substance of his meetings with the Pashtun tribal chiefs and leaders, his movements and the routes he would follow so that US forces could intervene to rescue him if he was attacked by the Taleban forces. After the Taleban forces killed Afghan commander Abdul Haq on 21 October 2001, when Karzai was on a mission to ignite an uprising against the regime of Mullah Omar. Karzai's converting into a Mujahedin Leader: The Popolzai nobleman Hamid Karzai had slipped into Uruzgan in early October 2001 intending to foment an anti-Taliban uprising among his fellow khan in the Durrani tribe, and while he possessed a mere handful of guns, his most powerful weapon was legitimacy. The true details of his quest, probably the only adventure in the war likely to translate to celluloid, may never be known, for Karzai was only too conscious as he travelled of spinning a contemporary legend of leadership to pit against those of Massoud and Mullah Omar. One of its most crucial ingredients, if it were to succeed, was that it must seem a wholly Afghan enterprise, free of foreign influence, and that was harder. Karzai had been guarded by an 11-man Special Forces team, 'Texas One Two' (574th Team of the Green Berets 5th Special Forces Group), since first setting foot in Derawat, Uruzgan Province. When the Taliban surprised his party in early November 2001, his brother was at pains to refute Rumsfeld's tactless boast that US jets had bombed the assaulting force or that Karzai was removed from harm's way by an American helicopter. Nothing would ever have been made public about what truly befell the Popolzai prince were it not for a tragic accident that allowed Texas One Two's leader, Captain Jason Amerine, a rare display of openness about his secret, behind-the-lines operation. Karzai chose Derawat as his destination because it lay only two hours' drive from Tarin Kot, where Mullah Omar came to manhood, and it was, therefore, a fitting place to mount a challenge to his authority that came to resemble a duel between the two orders of Afghanistan, the customary - and the revolutionary fungus that came to feed upon it. "According to Hamid Karzai, Tarin Kot was the most important city in the psyche of the Taliban," Amerine said later. "It was the heart line of where the Taliban movement began." Texas One Two spent three weeks drilling local Pushtu fighters in the art of US-style combat before the Taliban ambush compelled them to disperse. "The message that he continued to spread was one of 'treat the prisoners well'," Amerine continued. "If we treated them well, they'd be willing to surrender and we'd be able to reintegrate them into society and the country could heal its wounds." This apparent magnanimity swayed the elders in Tarin Kot, then guarded by the lightest of garrisons, to evict the Taliban governor, at which point Karzai moved in his forces, numbering in the low hundreds. But Mullah Omar had already sent a column of 500 men in 80 pickups and trucks, chiefly Arabs from Al Qa'ida, with orders to "slaughter the town, kill the women and children, kill the men, leave them in front of their houses and [..] make an example of Tarin Kot." It was nightfall on the first day of Ramazan when the Taliban convoy arrived on the outskirts, six hours after Karzai's men had made their own appearance. The men of Texas One Two were bidden to break their fast before going to the defence of the town. Almerine summoned Karzai's fighters and set up a firing line on a ridge looking over the main road into Tarin Kot where they waited until dawn. As the first vehicle came in sight, he called in air support. "It was kind of strange," he recalled, "because they just kept coming into the valley and we just kept bombing them." At a crucial point, Karzai's forces panicked and ran home, but they were cajoled back to the ridge and the Arabs, "an extremely motivated force", finally withdrew, leaving the valley strewn with the wreckage of bombed and burning vehicles. US intelligence estimated the Taliban had taken losses of more than 300 men. "That night, all the religious leaders of [..] northern Uruzgan came to speak to Hamid Karzai," Amerine continued. "I was sitting there when they came in and he was very concerned that maybe they'd be speaking against the Americans being there, but they told [him] that, if it hadn't been for our presence, they'd all be dead. So, from then on, they pretty much had positive things to say about the Americans working with Hamid Karzai's forces... From then on, I'd say our relationship was sealed. Shortly after Karzai was elected to be interim leader of Afghanistan, Amerine was hit by friendly fire from a bomber. He lost three of his friends in the explosion. The United States Central Intelligence Agency (CIA) has honored one of its veteran officers who had once saved the life of the former Afghan President Hamid Karzai. The officer who has now retired after serving for almost thirty years has been identified as Greg Vogle. According to the reports, Vogle has served in various missions domestically and internationally while he was serving as the CIA officer. However, he attracted the media attention and became famous after reports emerged regarding his devotion while saving Karzai’s life during a friendly airstrike in 2001. The airstrike was mistakenly called in by another American officer as a gathering was underway in southern Kandahar province of Afghanistan amid ongoing offensive to topple down the Taliban regime and eliminate the Al-Qaeda terrorist network from the country. Vogle reportedly used himself to shelter Karzai and pushed him to ground so that his can life be saved from the airstrike. According to the officials, at least three Americans and five Afghans had lost their lives in the airstrike. The Afghan presidential election has been affected by widespread fraud, according to an investigation report released on 19.10.2009 by the UN-backed Electoral Complaints Commission (ECC). Based on its investigation, the ECC has ordered the Afghan Independent Election Commission to invalidate 210 polling stations around the country where the ECC found clear and convincing evidence of fraud. The ECC also decided that 18 polling stations quarantined by the IEC may be included in the results because it found no clear evidence of fraud. In all, more than 5 million votes were cast in the election. About 1.3 million of those ballots were invalidated in the investigation, according to the Democracy International tally. An independent calculation by an election monitoring group, Democracy International, showed Karzai with 48.3 percent, or about 2.1 million votes, after more than 995,000 of his votes were thrown out for fraud. Afghan President Hamid Karzai had to accept the fraud panel finding and endorsed the runoff election. The Afghan election commission ordered presidential runoff on Nov. 7, 2009. The runoff election between Hamid Karzai and Dr. Abdullah Abdullah didn't happen, because Abdullah withdrew, because he feared that the runoff might be as marred as the Presidential Election. So Hamid Karzai was declared President. Karzai is married and has three children.